With Father's Day just around the corner, Great American Cookies is inviting customers to celebrate what makes their dad one of a kind with a made-to-order Cookie Cake created just for him. Cookie Cakes are available in a variety of sizes and feature festive designs for any of Dad's interests. 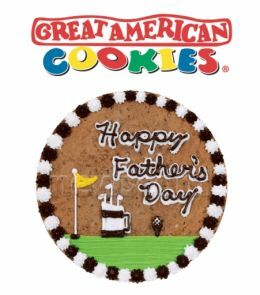 The celebration is supported by NexCen Franchise Management, Inc., a subsidiary of NexCen Brands, Inc.
Great American Cookies' Cookie Cake catalogue features a variety of Father's Day designs including themes around fishing, music, golf, football, and more. Customers can also work with a Great American Cookies cookie artisan to create a completely unique design for their dad. Cookie Cakes are backed by the Great American Cookies customer promise: All Cookie Cakes are baked fresh in store daily, will have a personalized message, and 16-inch Cookie Cakes can be ready in 15 minutes or less. Customers can stay up to date on all of Great American Cookies' new products and promotions by becoming a fan on Facebook, following the brand on Twitter, or by joining Great American Cookies' e-mail fan club.